In this inspirational call to action, Marc Bekoff, the world’s leading expert on animal emotions, gently shows that improving our treatment of animals is a matter of rethinking our many daily decisions and expanding our compassion footprint.” He demonstrates that animals experience a rich range of emotions, including empathy and compassion, and that they clearly know right from wrong. Driven by moral imperatives and pressing environmental realities, Bekoff offers six compelling reasons for changing the way we treat animals — whether they’re in factory farms, labs, circuses, or our vanishing wilderness. The result is a well-researched, informative guide that will change animal and human lives for the better. Dr. Marc Bekoff is professor emeritus of ecology and evolutionary biology at the University of Colorado, Boulder, and is a scholar-in-residence at the University of Denver’s Institute for Human-Animal Connection. 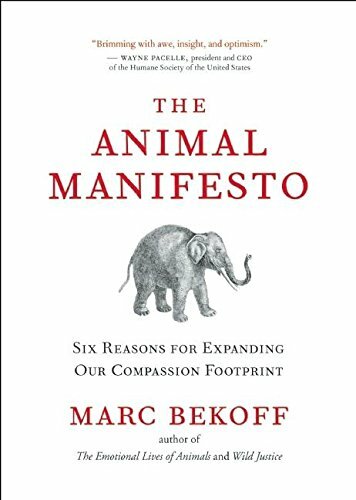 Marc Bekoff's brilliant and beautiful The Animal Manifesto is as important a book on our commonalities with other species as Darwin's book on emotional expression. It will lead you in a moving fashion to reconsider your own origins and will guide you toward uplifting actions that will make for a healthier fate of our human earth. It is essential reading.